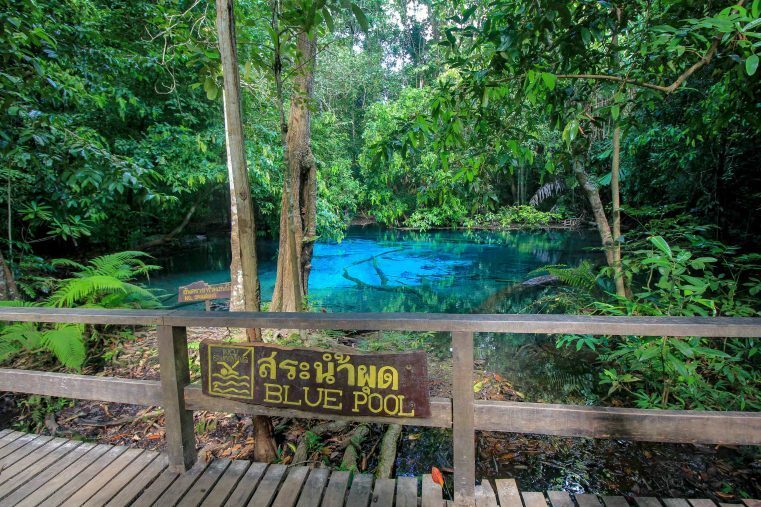 The Emerald Pool or also called Sa Morakot is is a natural turquoise blue pond with fresh water supplied from natural streams coming down from the hills. Located in the province of Krabi in Thailand it is one of the TOP excursions in the region. 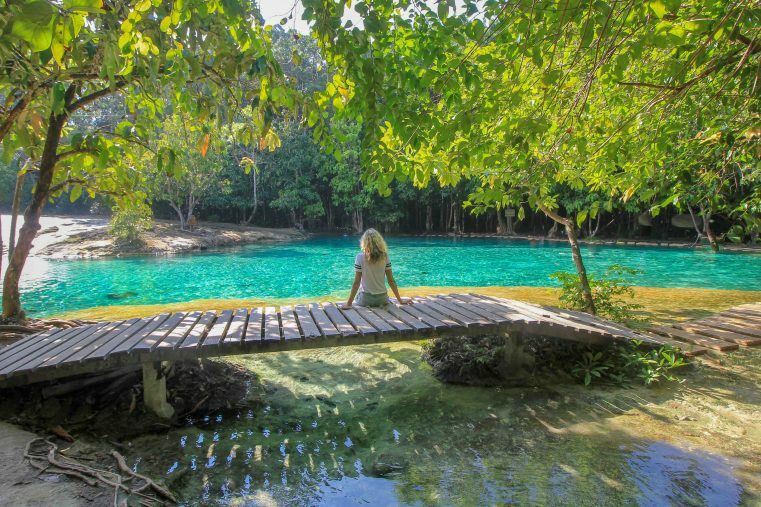 In the middle of a mystical jungle you can discover two crystal-clear lakes, the picturesque Emerald Pool and the Blue Pool. During a short hike through the forest you have the opportunity to explore an intact ecosystem. 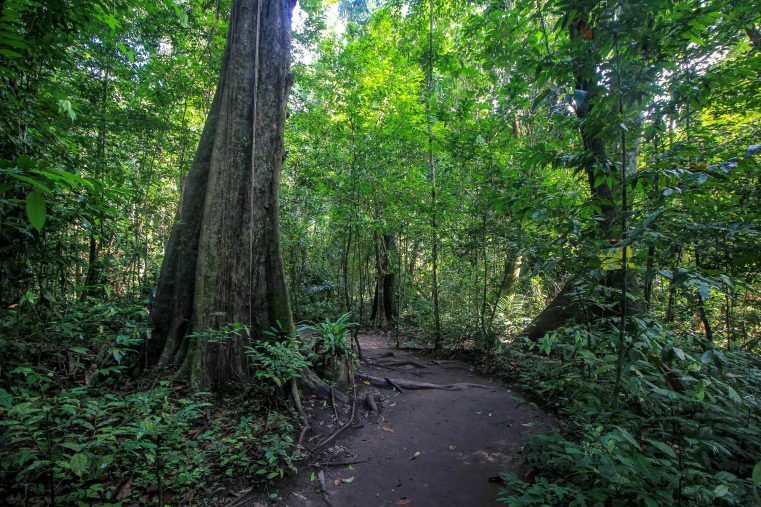 Sure you will be impressed by the unique ambience of the rainforest. If you fancy a bath, you can take your bathing suit with you! Its possible to take a refreshing bath in this beautiful setting. In this blog article you will get all the important information about the Emerald Pool and we will show you why a visit is absolutely worth it! Already the walk to the Emerald Pool is really enchanting and a true nature experience. A very well signed foodpath leads about 1.4 kilometers into the jungle. 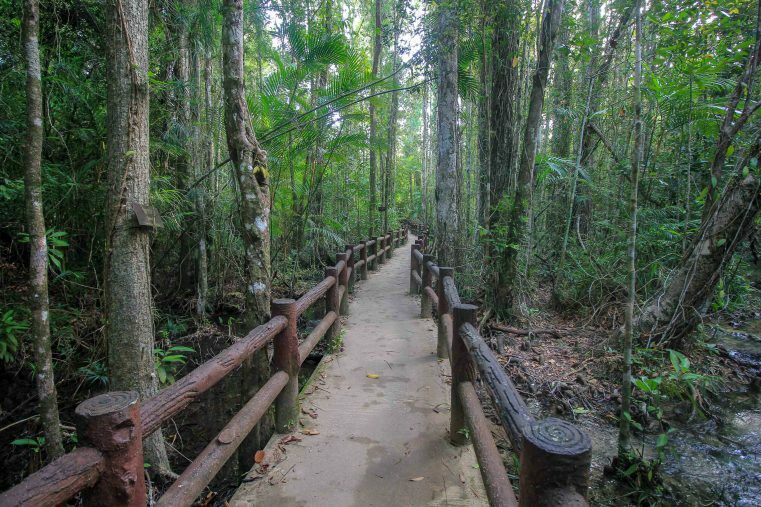 You will walk past crystal-clear streams, small yellow ponds and a huge variety of tropical plants and trees. The jungle path eventually leads to the Sa Kaew, the Crystal Pool, and finally ends up right at the main attraction of the park, the Emerald Pool. Already from afar, the turquoise blue water shimmers through the trees. Arrived at the poll you have the opportunity to refresh yourself. 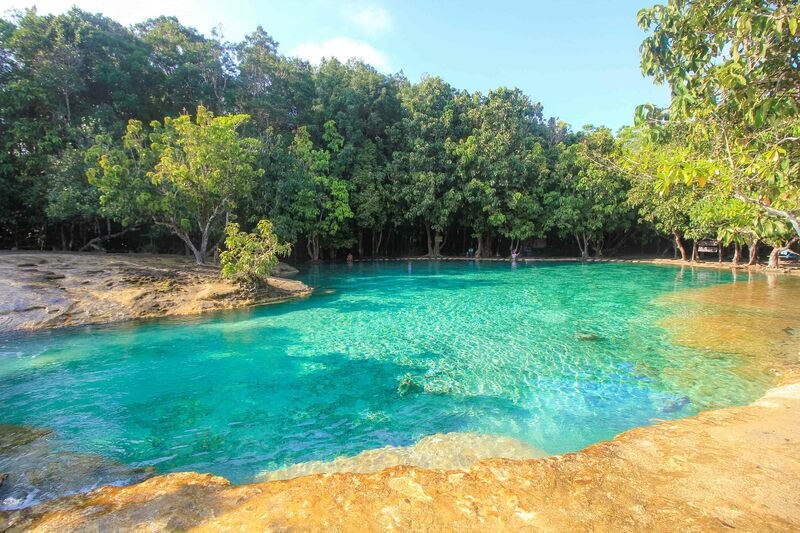 The Emerald Pool is around 1-2 meters deep so if you feel like bathing you should definitely go for it. The ambience of the pool is really beautiful and photographers will love it there. Since the limestone rocks are very slippery, you should be careful when entering the waters. Wearing bathing shoes is recommended. By the way, the incredibly beautiful turquoise blue colours are caused by the high limestone and mineral content of the lake. 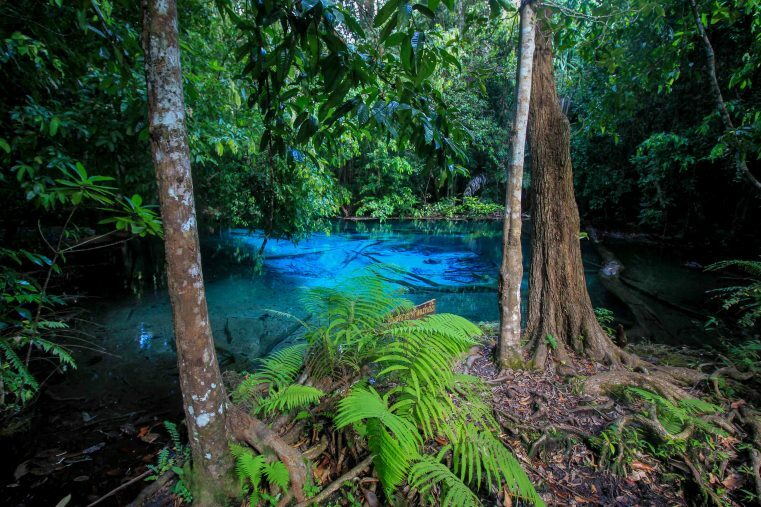 Another highlight of the National Park is the Blue Pool, a small deep blue pond surrounded by deep jungle. This Blue Lagoon is easily accessible via a 400-meter long footpath and also here the trail is well signed. 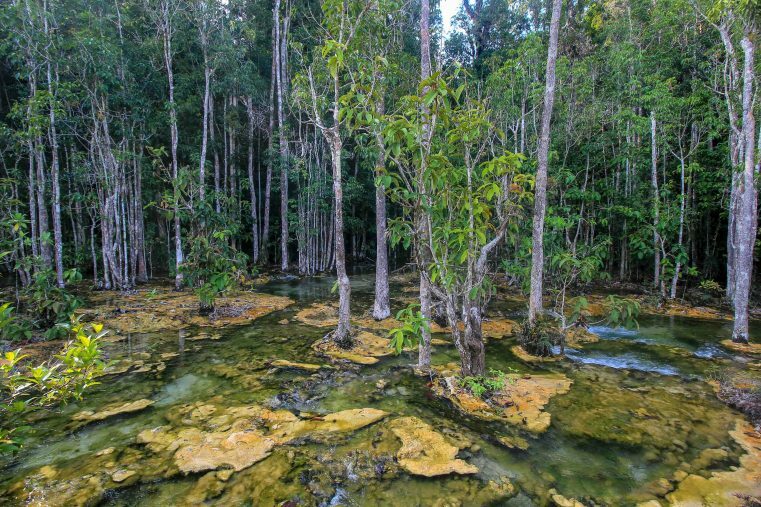 Among others, you pass a small temple, huge tropical trees and small clear rivers. Here is the bathing, unlike the Emerald Pool,forbitten. The Blue Pool is supplied by a hot underground spring. If you look closely you can even discover the small air bubbles. 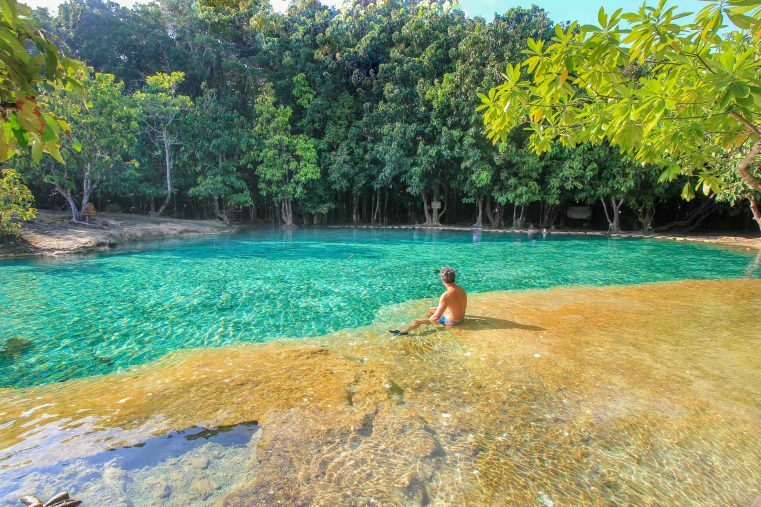 Excursions to the Emerald Pool are offered by many travel agencies in Krabi Town, Ao Nang and Klong Muang Beach. The tour usually includes pick up from the hotel, lunch and a visit to the Hot Springs and Tiger Cave Temple. On this kind of guided tour, you have the disadvantage that you have to share this fabulous place with numerous other visitors. The chance for good photography and a quiet place is in vain. It is better to organize the transport to the Emerald Pools on your own. A taxi from Krabi Town to the National Park and returns costs around 1,800 baht and can be shared with multiple passengers. The drive to the national park takes about 1 hour (60 kilometers). To escape the tourist crowds set up your timings early. To make sure that you will have this beautiful scenery almost for yourself, you should start your trip in the morning (7:00 clock). 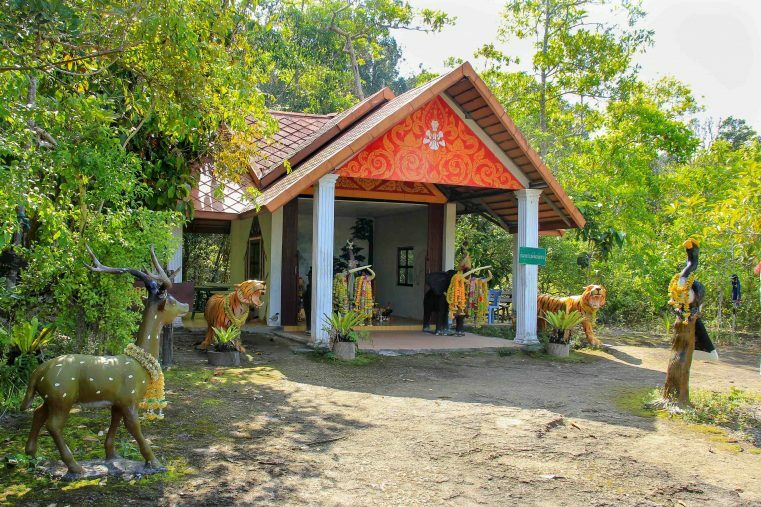 If you still haven`t had enough from sightseeing you should visit the Tiger Cave Temple on your way back to Krabi. The Emerald Pool opens its doors for visitors from 8:00 and close at 17:00. The Blue Pool opens a bit later, so the park will give open the access from 10:00 clock. The entrance fee is 200 baht per adult and 100 baht per child. A visit to the Emerald Pool is possible all year but be aware that the Blue Pool is closed from May to October. The best hotels and bungalows near the Emerald Pool can be found in the larger tourist destinations such as Krabi Town, Ao Nang and Klong Muang. Under the following links we have put together the best accommodations for you. Check out where to stay in Krabi for more information about the best hotels and accommodations in Krabi Province.